We investigate the sensitivity of the transient climate change to a tidal mixing scheme. The scheme parameterizes diapycnal diffusivity depending on the location of energy dissipation over rough topography, whereas the standard configuration uses horizontally constant diffusivity. We perform ensemble climate change experiments with two setups of MPIOM/ECHAM5, one setup with the tidal mixing scheme and the second setup with the standard configuration. 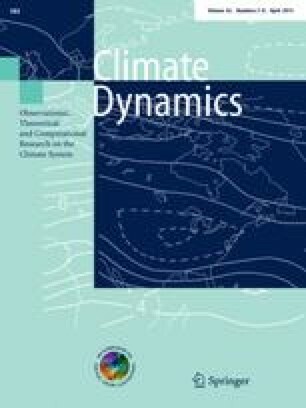 Analysis of the responses of the transient climate change to CO2 increase reveals that the implementation of tidal mixing leads to a significant reduction of the transient surface warming by 9 %. The weaker surface warming in the tidal run is localized particularly over the Weddell Sea, likely caused by a stronger ocean heat uptake in the Southern Ocean. The analysis of the ocean heat budget reveals that the ocean heat uptake in both experiments is caused by changes in convection and advection. In the upper ocean, heat uptake is caused by reduced convection and enhancement of the Deacon Cell, which appears also in isopycnal coordinates. In the deeper ocean, heat uptake is caused by reduction of convective cooling associated with the circulation polewards of 65°S. Tidal mixing leads to stronger heat uptake in the Southern Ocean by causing stronger changes in advection, namely a stronger increase in the Deacon Cell and a stronger reduction in advective cooling by the circulation polewards of 65°S. Counter-intuitively, the relation between tidal mixing and greater heat storage in the deep ocean is an indirect one, through the influence of tidal mixing on the circulation. We would like to thank Suvarchal Kumar Cheedela for the constructive discussions. We thank the three anonymous reviewers for their useful comments. The model integration was performed on the Linux-cluster of the German Climate Computing Center (DKRZ) in Hamburg. This work is supported by the Max Planck Society and the International Max Planck Research School on Earth System Modelling.